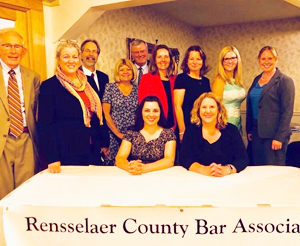 The Rensselaer County Bar Association is dedicated to its mission of serving members of the bench, bar and community of Rensselaer County, New York. Please explore this website to find information on our organization, quarterly newsletters, happenings in the legal community, and information on how to join our organization. The association is attempting to modernize our membership mailing list and to incorporate a master email list so that we may send out timely notices to our members. If you have not received a dues notice or contact update form, please contact us by email at info@renscobar.org to add your name to our new list. Megan B. Van Aken, Esq. Carl J. Kempf III, Esq. 2019 Membership Dues are now due Here is the 2019 Dues Notice and a Letter from President Jessica B. Mocerine.